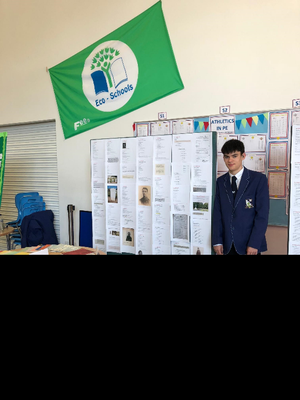 Grove Academy pupil Jacob Latto writes about the continuing impact of World War One on modern life. Visiting Belgium’s Battlefields in June 2017 had a profound effect on me. I have always had a real interest in history and to be able to stand where they stood, to show my respect to the fallen men of the Great War has been a great honour. Hearing stories of boys, not much older than me, making the ultimate sacrifice was truly humbling. As I laid the wreath at the Menin Gate in Ypres, I took a step back and cast my eyes around the white walls which had been engraved with the names of the fallen; soldiers whose bodies had never been laid to rest. The beauty of the building stood as a fitting tribute to the men who had lost their lives and I was privileged to be one of only three people chosen to lay the wreath on behalf of my school. 57,470 men lost their lives in the Somme on the first day of battle alone. 57,470. I cannot even comprehend the sheer scale of the loss. That’s 2,395 deaths an hour; 40 deaths a minute. For every yard of mud gained, two lives were sacrificed. The tour guide continued to rattle off his statistics. The direct experience of loss of life seen driving past the hundreds of cemeteries across Belgium and France, left me wondering if that there could have been a way to avoid losses through better relationships between countries. Recently, I discovered while working on a project on the Sustainable Development Goals, one in particular stood out to me, as the first seeds of a potential solution to reducing this devastating loss caused by war. Goal 16: peace, justice and strong institutions is about encouraging us to reduce all forms of violence and related deaths everywhere. World War One has showed us how violence and war caused thousands of lives to be sacrificed so we could gain freedom in this country. In other countries such as Syria, people are still experiencing war. Many conflicts around the world have resulted in 20 people being displaced every minute. So we have a long way to go to gain total world peace, but these are great first steps. Since that trip, my school has been actively remembering the fallen soldiers of World War One who had attended Grove Academy. We want to remind people the human cost of war so this type of war doesn’t arise again. Now in S5, I joined the Commonwealth War Graves Commission working group. We organised and put together a range of displays for Doors Open Day on Saturday 8th September 2018. We had a display of the names of our former pupils, ages, place of death and family members. All 93 of them. Putting a face to the soldiers’ names made their existence more real. Last year I signed the Grove Eco Group up for ‘Ribbon of Poppies’, a voluntary group encouraging members of the public to plant poppies from Land’s End to John O’Groats. 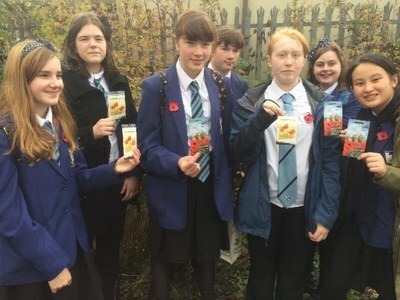 The Eco Group sowed seeds that came straight from the Battlefields into Queen Street and Sheill Street community gardens. We want the poppies to be a reminder of conflicts and to stop conflicts in the future. With help from the Techy Department, I engraved a piece of slate that remembers the soldiers from our school. Mr Anderson, who ran this year’s Battlefield Trip, took the slate to the Black Watch Memorial in Belgium near Ypres. The memorial is near to where some of our former pupil are buried or remembered. For the last few years the Eco Group have organised a scarecrow trail in Broughty Ferry. We wanted to have a WW1 display in Queen St Community Garden. We asked members of the public to make poppies and were so pleased with the wonderful knitted and felt poppies that were dropped off or sent through the post. Two textile classes at school made felt poppies too. The Prince’s Trust group at Grove took on the job of designing a wall display using the poppies and a WW1 scarecrow to go with it. 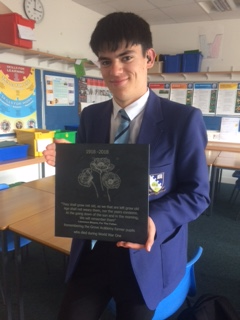 The design is shown below and it includes the names of the 93 former pupils who died during the war. 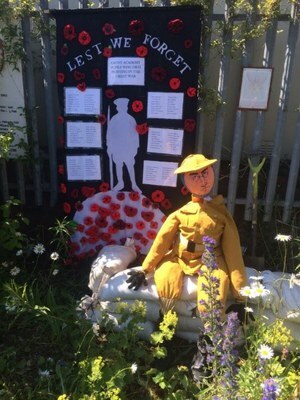 The YMCA in the Broughty Ferry also made a soldier scarecrow that represented a local soldier that died in the war.